Yes, I would love to meet Justin Bieber because he is super talented and seems like a very cool guy. But the title actually refers to a fabulous promotion that I am working on for Garage Clothing, where one lucky person will win a trip to bring 2 friends to meet Justin Bieber! Every year, Philadelphia radio station Q102 organizes a mega concert called "Jingle Ball" where they bring together an amazing roster of popular musicians. This years list of course includes Justin Bieber, and also The Wanted, One Republic, and even Gangnam Style phenom PSY. 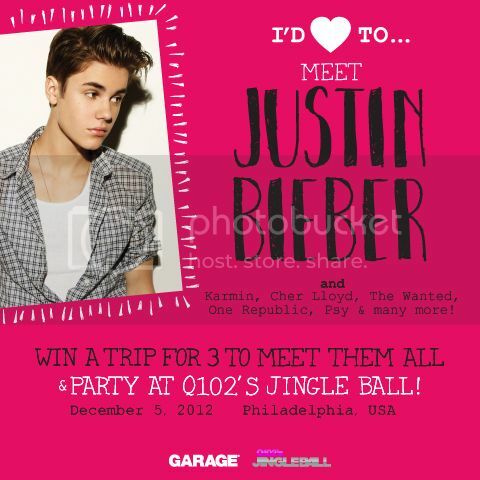 Garage Clothing is one of the main sponsors of Jingle Ball, and are having a contest on their facebook page for one person to win an all-expenses paid trip together with 2 friends to travel to Philadelphia to attend the concert, AND to be able to meet Justin Bieber as well as the band members of The Wanted, One Republic, and the other musical acts!